Explanation: Recorded on April 15th, this total lunar eclipse sequence looks south down icy Waterton Lake from the Waterton Lakes National Park in Alberta, Canada, planet Earth. The most distant horizon includes peaks in Glacier National Park, USA. 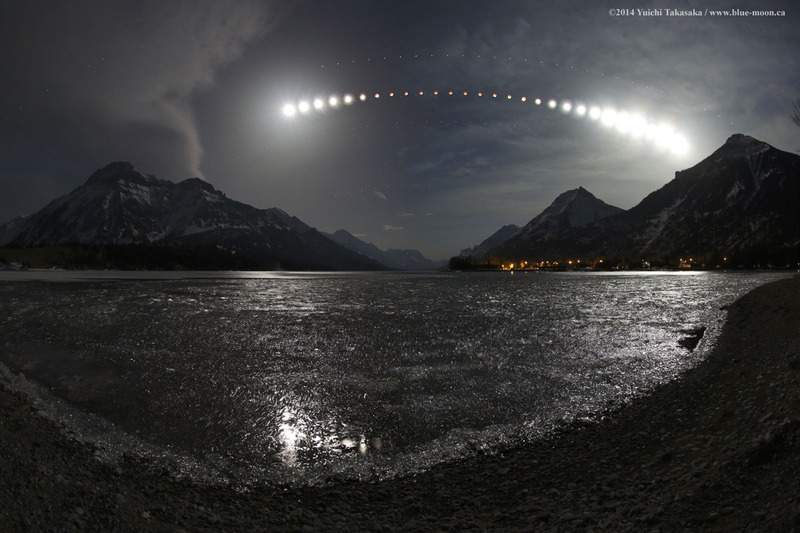 An exposure every 10 minutes captured the Moon's position and eclipse phase, as it arced, left to right, above the rugged skyline and Waterton town lights. In fact, the sequence effectively measures the roughly 80 minute duration of the total phase of the eclipse. Around 270 BC, the Greek astronomer Aristarchus also measured the duration of lunar eclipses - though probably without the benefit of digital clocks and cameras. Still, using geometry, he devised a simple and impressively accurate way to calculate the Moon's distance, in terms of the radius of planet Earth, from the eclipse duration. This modern eclipse sequence also tracks the successive positions of Mars, above and right of the Moon, bright star Spica next to the reddened lunar disk, and Saturn to the left and below.